The Rose Gold Tone Figaro is a classic stainless steel medical ID bracelet design with an on-trend rose gold tone finish. Safe for use in the water, this durable medical alert is designed for everyday wear. 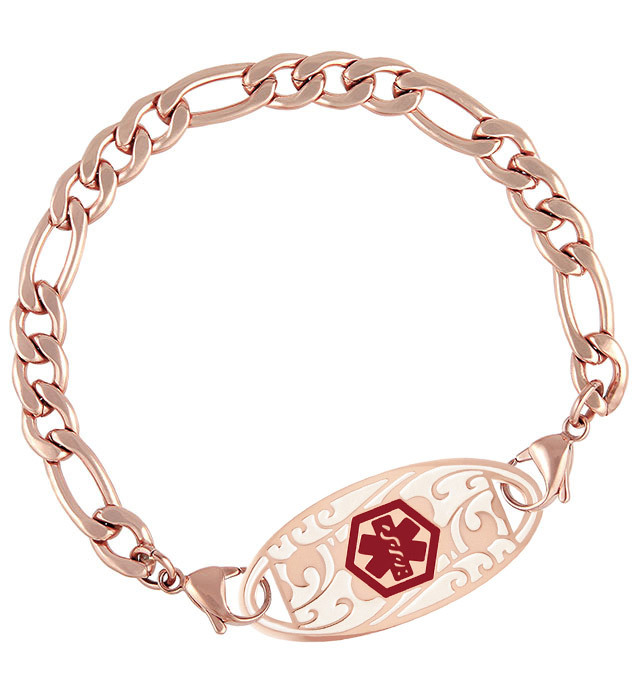 If you like this one, you’ll love our other chain-style, rose gold tone medical ID bracelets for women! As with all of our interchangeable designs, you can wear the Rose Gold Tone Figaro Medical ID Bracelet with any custom-engraved Lauren’s Hope medical ID tag, keeping what’s truly most important to you right at hand. This stainless steel med alert is a great choice whether you wear your medical alert bracelet for a history of weight loss surgery, celiac disease, epilepsy, Long QT Syndrome, or any other chronic medical condition or treatment consideration. Custom engraving allows you to choose the look you want so you can stay safe in style.